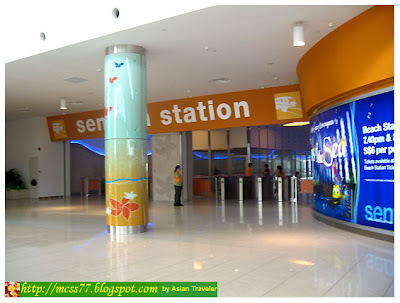 Upon arrival at Vivo City shopping mall, we went straight ahead to Sentosa Express ticketing station located at level 3. 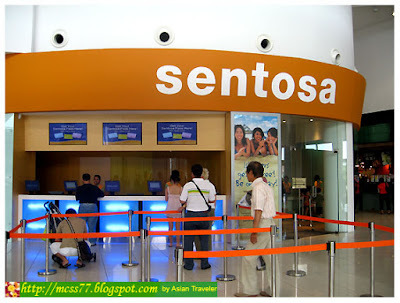 We purchased the single day Sentosa Pass (S$3 per person) that allows unlimited rides on the Sentosa Express including admission into Sentosa park. 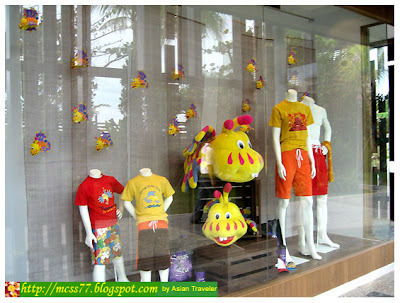 Sentosa, which means peace and tranquility in Malay, is a popular island resort and themed entertainment including family attractions, beaches, golf as well as hotel accommodation and retreats in Singapore. 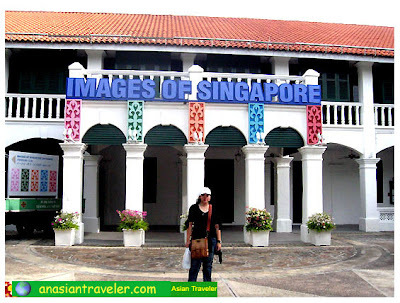 It lies just half a kilometer away from the southern coast of the main island of Singapore. We made our way and hopped into a colorful two-car train. 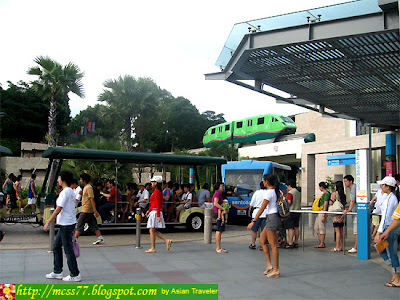 The monorail has four stations on Sentosa and departs every 5-8 minutes from 7:00 am to 11:45 pm daily. We arrived at Siloso Beach Station which lies at the western portion of the southeast coast. 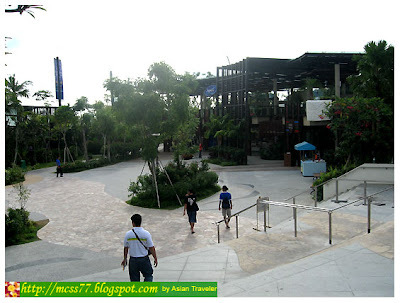 We began by walking and exploring the area. The place is wide with lush parkland and gardens, very clean and tidy. 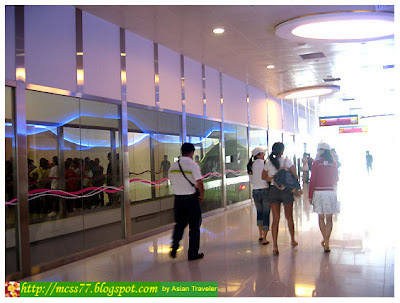 There were lots of people around and various trams shuttle in the parking area (close to the main entrance). Then we popped round at Oscar and Company boutique, selling souvenirs ranging from plush toys, photo frames, magic wand, clocks, ballpens, towels to clothes and children's slippers. The shop also offers photo services. I bought several Sentosa hand towels jacqua (S$7.90 each), and 3-Fold super flat umbrellas (S$9.90 each). I got a 20% discount for showing them our Songs of the Sea tickets. The shop opens at 11:00 am to 9:30 pm daily. Located near Siloso Beach Walk is Siloso Beach, known to many as the place for beach volleyball and other outdoor activities such as canoeing, skim boarding, mountain biking or rollerblading. 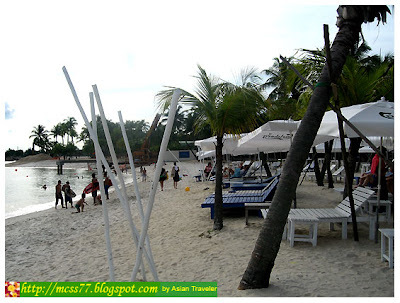 There are cabana-style sun lounges, umbrellas and bistros along the beach. You'll also see some people walking around the park in their bathing suits. Since Siloso beach is man-made (reclaimed using sand bought from Indonesia and Malaysia), quite honestly I wasn’t all that impressed. Maybe it’s because I’m used to richness of nature here in the Philippines, which is distinctively blessed with many beautiful beaches and magnificent shores. 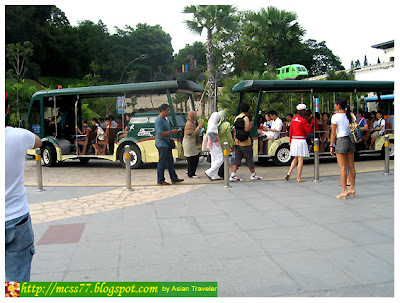 Then we hopped on the Sentosa Express again and arrived at Imbiah Lookout, which is located near Mount Imbiah and is known for a collection of various attractions. First, we checked out the Merlion, the Singapore's tallest tourism icon. 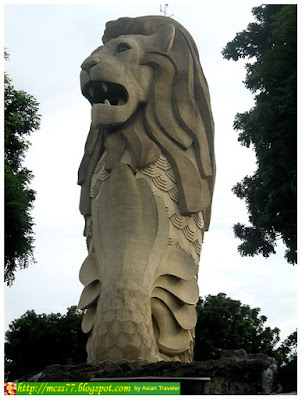 The Merlion symbolizes in its fish body the ancient city of Temasek, and its lion head, the legend of its discovery. 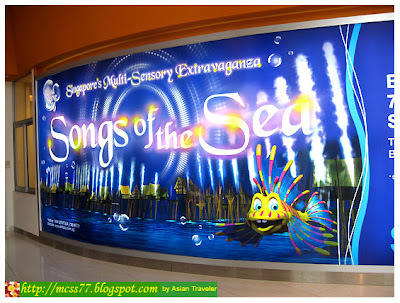 Visitors can view the Singapore city skyline and Sentosa from the top of the 37m high through Merlion's mouth and head. 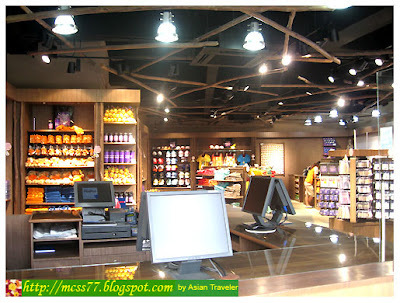 Entrance fee is S$8.00 for adults and S$5.00 for children. 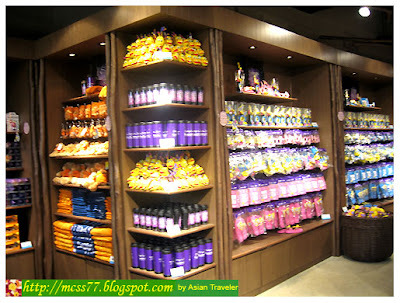 They are open from 10:00 am to 8:00 pm daily. Last entry is 7:30 pm. Soon we moved to Images of Singapore. 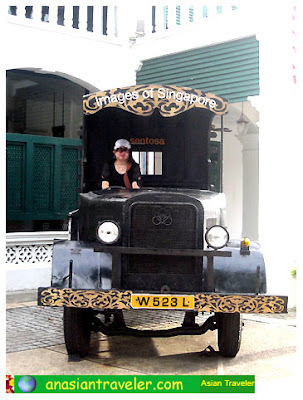 Guests can experience Singapore both past and present cultural diversity. The life and times of the four main races that make up the island nation through historical exhibits, interactive displays and live shows. 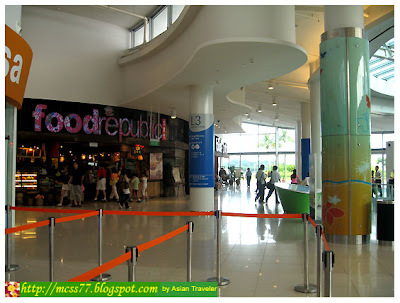 Admission is S$10.00 for adult and S$7 for children. Open from 9:00 am to 7:00 pm daily (last entry 6:30 pm). 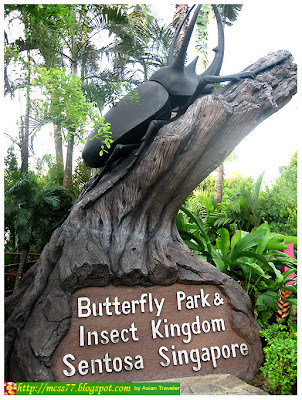 Then we stopped by at Butterfly Park and Insect Kingdom. Here you can stroll around the surroundings and experience the many butterflies fluttering around and explore the many species of the world’s most beautiful and rarest insects. Admission is S$10 for adults and S$6 for children. Opening hours from 9:00 am to 6:30 pm (last entry 6:00 pm). I like your statement and agree with it. 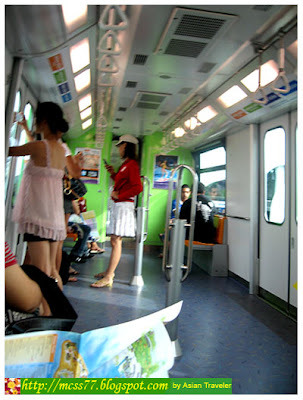 Travelling makes us more understanding and tolerant to other people and peoples. Ignorance is the origin of most bad things. Hi José, thanks for the visit and for the nice remark. I wish you also the best of luck in your endeavors as an artist.